WOW!! This 7th FLOOR, COMPLETELY RENOVATED! 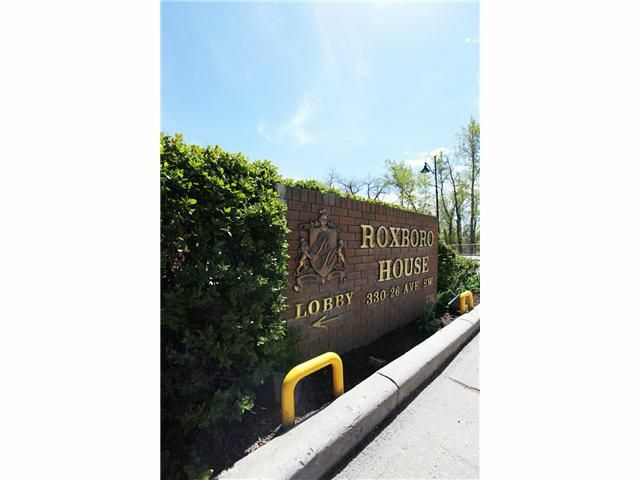 SOUTH facing unit has BRAND NEW CENTRAL AC and is located in the EXCLUSIVE ROXBORO HOUSE building with SPECTACULAR VIEWS and a PRIVATE BALCONY!! Just under 1250 sq ft, this HUGE 1 bedroom MASTER SUITE has a beautiful 5 piece ensuite bath and SPACIOUS closets, a DEN that is large and PRIVATE enough for overnight guests, a large half bath with full size laundry! SPECTACULAR features like HARDWOOD FLOORS, LEATHER finish GRANITE COUNTERTOPS, STAINLESS STEEL APPLIANCES, a THERMADORE built in ESPRESSO machine and WINE FRIDGE built into the buffet!! Entertaining here is a breeze and your family and friends will LOVE it!! And the LOCATION, across from the River, only a few blocks into the DOWNTOWN core, the C-Train, BIKE PATHS and a short steps to MISSION'S amazing shops, diners and restaurants!! Oh and did I mention the 24 hour indoor swimming pool, hot tub and the HUGE common PATIO?? Call your favorite Realtor to view!